Every year, nearly 70 billion animals across the world are farmed for meat, milk and eggs. Increasingly, consumers and investors alike are demanding more transparency and integrity around how these animals are reared, transported and slaughtered. This rise in the importance of animal welfare heralds an era where the ethics and values of manufacturers and the consumers they serve are becoming more aligned than ever before. In Australia, the RSPCA defines Farm Animal Welfare in the terms of five essential freedoms. Ethical shopping is not a new trend. Traditionally the most common themes amongst ethical consumers have been issues surrounding locally sourced products, organic food, environmental impact and Fairtrade. However, recent trends have seen a significant increase in the importance of farm animal welfare in the decision making process for consumers. 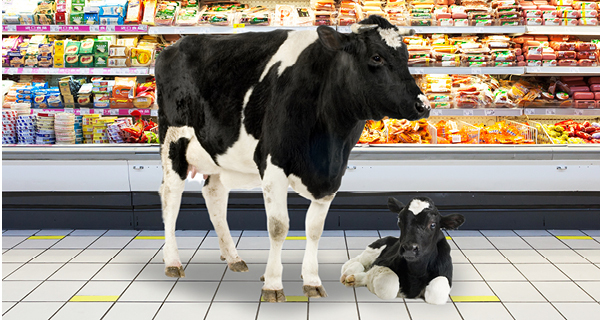 In 2006 the Retail Research Organisation in the UK reported that 11% of consumers considered animal welfare issues as very important when deciding what to buy. 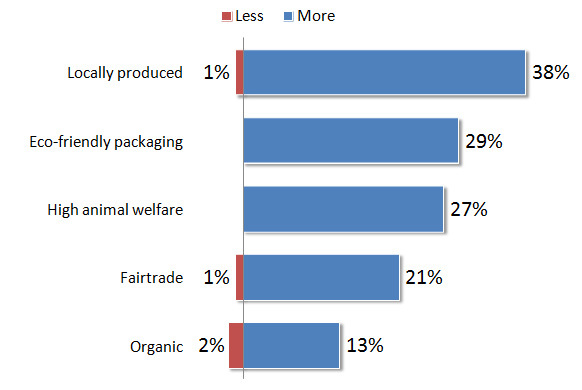 In a similar study conducted in 2012 by IGD Retail Analysis the importance of farm animal welfare issues was ranked at 47%, equally as important as local sourcing. The IGD Retail Analysis report into ethical shopping also indicated that the importance of animal welfare in the decision making process for consumers will continue to increase in the near future. As with any trend seen amongst end consumers, investors are soon to follow. In 2012, The Ethical Corporation launched the Business Benchmark on Farm Animal Welfare (BBFAW) – the first global measure of company performance on animal welfare management and reporting practices. The benchmark report is conducted annually and has been designed to provide discerning investors with an impartial assessment of company efforts to adopt higher farm animal welfare standards and practices and includes some of the world’s largest food and beverage companies. 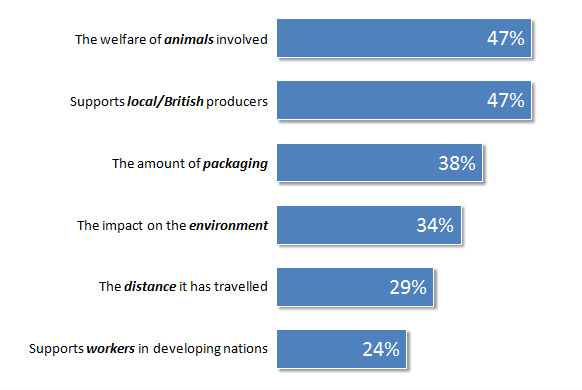 The most recent report from 2014 indicates that the standards and reporting on Farm Animal Welfare amongst food and beverage companies worldwide is improving – from an overall score of 23% in 2012 to 30% in 2014. Companies are also incorporating Farm Animal Welfare standards into their environmental CSR policies and ethical supply chain practices. One recent example is Audi Süd, which in February 2015 launched a new purchasing policy for all suppliers, including strict farm animal welfare standards for both food and non-food products such as textiles, clothing and cosmetics. Farm Animal Welfare will continue to be a key issue for consumers and investors in the future and indications show that the level of concern for these issues is only going to increase. As more and more of the leaders within the food and beverage industry focus on improving their Farm Animal Welfare standards and reporting policies, competitors and suppliers alike will need to follow suit if they wish to stay in the game. Here, in Australia, these practices are fast becoming standard operational requirements for many abattoirs, saleyards and protein manufacturers with upgrades to existing lighting, flooring and the general design of these facilities. One trend in this drive for transparency is the installation of CCTVs by processors to demonstrate their best practice by providing real-time monitoring of the behaviour of both animals and personnel. 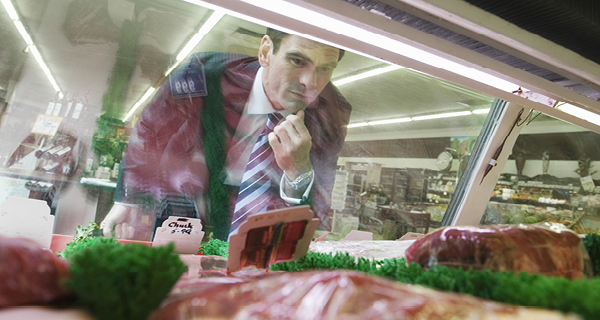 External Industry, retail and consumer bodies are also consistently conducting audits of processors to confirm best practice operations of animal welfare. Beyond the need to comply with the requirements of customers, producers can potentially reap a number of additional benefits from improved Farm Animal Welfare that can translate to the bottom line. Healthy and well cared for animals can not only deliver a better return by increasing efficiency and potential yields and reducing incidences of illness and death, it is also crucial to the sustainability of the industry in the long-term. Australasian multidisciplinary Design, Engineering and Project Management Company Wiley brings decades of specialised food production experience and a passion for leading the food industry into a future where transparency, integrity and quality are the core values underpinning every meal we help create.